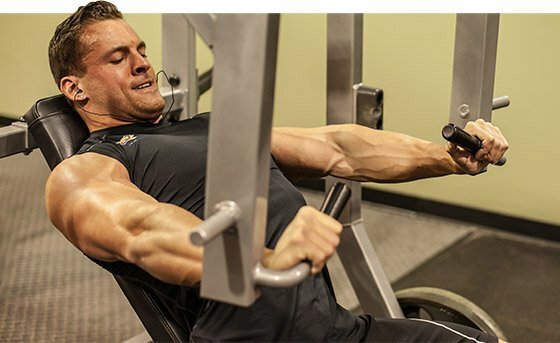 Ryan Hughes' chest workout isn't the usual bench press extravaganza. 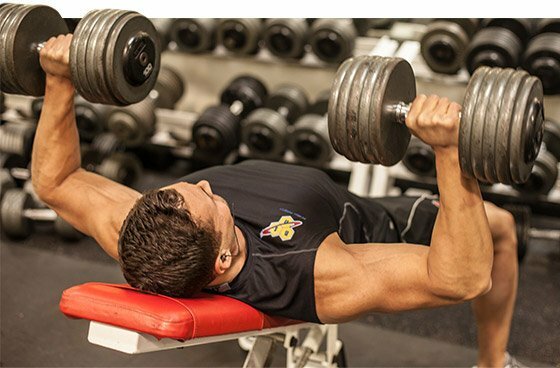 It's a high-intensity, high-volume, heavyweight pec blast that will challenge every aspect of your fitness level! Back when I only had 135 pounds on my 6-foot-1 frame, I had to deal with the usual labels: ectomorph, hardgainer, skinny kid. I didn't care for those words then, and I don't like them any better now. I used weights to change my physique. I love to train heavy, I love to move quickly, and I love the pump I get from high volume. I put all three of these elements into each workout I do, and I couldn't ask for better results. Today's chest workout is no different. It combines a fast pace to keep your heart rate up, high volume for an insane pump, and heavy weights to make you stronger. When you put each of these pieces together, you end up with a max-effort workout that will challenge all aspects of your fitness level. One of the toughest aspects of this workout is the mental game. Your body will always have that extra rep, or that extra set, but you have to find the mental energy to get it done. I may not be the biggest or strongest guy in the gym, but I guarantee no one can outwork me. If you've never done this type of training before, you might find it difficult. If you fail, put the weight down and give yourself a little break before you finish the set. You want the shortest rest periods possible, but do whatever you need to get the work done. Never give up on a set. 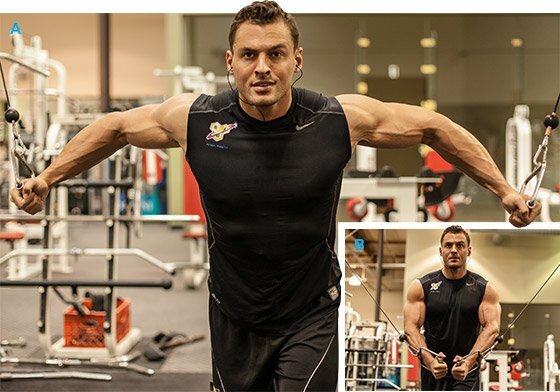 A lot of guys tell me that they want to build the best physique ever. I think that's the wrong approach. Don't focus on being the best ever, focus on building your best physique ever. Max out what you can do. If you constantly compare yourself to everyone else, you'll sell yourself short. Hit this workout with all you've got and reap the personal rewards. I like to do a couple warm-up sets before starting the first heavy set. Don't go too heavy on the warm-up because you'll wear yourself out. Eighty total reps is a lot of reps, so you have to keep an eye on muscular endurance. This is a chest marathon. I start with 75-pound dumbbells for the first warm-up set and then go up to 85 pounds for the second. When I start my working sets, I go up to 100 pounds. Don't worry about what I'm doing, though. Pick a weight that's challenging for you. This style of training is mentally draining. Dig deep and do your best on those last couple sets. If you need to rest-pause to hit the total rep count, do it, but make sure you finish every single rep.
You can do these with whatever grip you prefer. Challenge yourself with the weight and then increase it every set. You might feel like you'll never get those target reps, but trust me—I've been doing this long enough. One way or another, the reps will come. Use lighter weight for this exercise and focus on the contraction—squeeze on each and every rep. You want to push until you can't go anymore. Crush the barbell with your grip and engage your mind-muscle connection. If you fail on this exercise, don't panic. 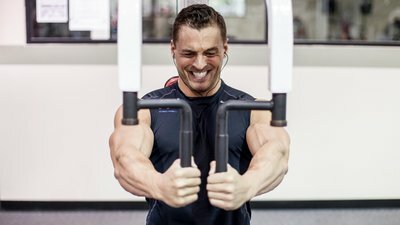 Let the weight briefly sit on your chest, reverse your grip back to normal, and press the bar back up. Make sure you don't round your shoulders forward: Keep your chest high and maintain a good arch in your lower back. Focus entirely on the chest and squeeze. Get as much as you can out of this exercise. Stretch nice and wide at the bottom of each rep, and squeeze at the top for a full contraction. Don't go too heavy or you'll round your shoulders forward. Keep the tension entirely on your upper chest. We're doing 100 total reps, so do as many reps as you can per set and as many sets as you need to get to 100 reps. I usually do four sets of 25 reps.
At the end of the workout, you'll be exhausted. You may want to give up and walk out. But at the end of the day, you always have those extra reps and extra sets in you. Leave them in the gym. Training with sandbags is catching on among a wide range of athletes. If you want strength and explosive power to help you rise to any challenge, step up to the bag! Boost Your Bench Press, Squat, And Deadlift! Mastering the three basic lifts is essential for building an awesome body. Learning these variations can turn awesome to amazing.